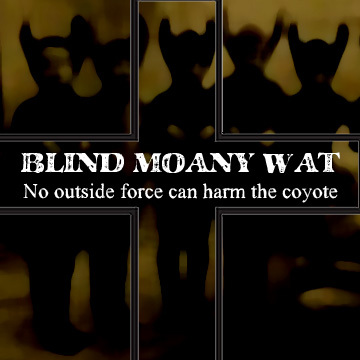 Blind Moany Wat returns with No outside force can harm the coyote. A gritty blur of lap-steel scrape, warped bass and synthesized smear, No outside force… comes from the porch of a dilapidated house at the edge of a ruined world. The tools are rusted and the sky is bruised. A crow steals guitar strings for its nest. Angry insects infest the synthesizers and a mouse died inside the drum machine some time ago. These tracks are its elegy. Blind Moany Wat infuses techno with a ragged bleakness, bursts of noise abuse lonely drums while a broken guitar raises a clangor in protest. A slow parade around a decaying center, these tracks invite you to explore a unique zone of sound where electronic precision collapses into a mutating heap emitting haggard ruckus. Take your jug of ale outside and listen while fall eats into summer.